Viva Broadway, an initiative of the Broadway League, in collaboration with 5000 Broadway Productions and the United Palace of Cultural Arts is thrilled to announce that Broadway’s 2008 Tony Award®-winning Best Musical IN THE HEIGHTS will be coming back to the stage in the form of a special, one-night only concert aptly named IN THE HEIGHTS: IN CONCERT. The concert will take place at The United Palace of Cultural Arts on February 11th, 2013. Tickets will go on sale via Telecharge.com on December 14th, 2012. The event, taking place near the 5th anniversary of the show’s opening night on Broadway, marks the first time ever members of the original Broadway and National tour cast including actor/composer-lyricist Lin-Manuel Miranda, Karen Olivo, Chris Jackson, Olga Merediz, Mandy Gonzalez, Robin De Jesús, Janet Dacal and others, will join together to bring IN THE HEIGHTS back to the uptown neighborhood that inspired it all. The Broadway League’s Viva Broadway initiative, a new audience development partnership with the Hispanic community to help bridge the world of Broadway with Latino audiences around the country, has embraced IN THE HEIGHTS: IN CONCERT as one of its signature events for 2013. The long-term initiative aims to increase awareness about Broadway while culturally enriching lives, bringing families together, and building new careers in the theatre. 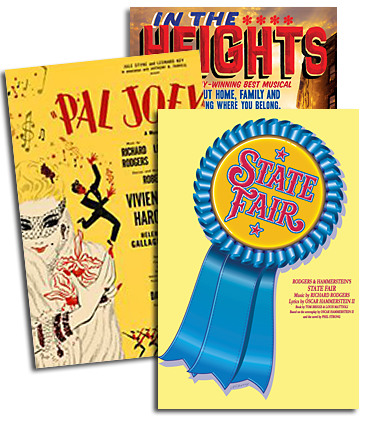 A surplus of ticket sales proceeds will go towards The Broadway League's Family First Nights®, a nationwide program specifically designed to encourage at risk families to attend theatre on a regular basis and to local arts programs in Washington Heights. With the 2009 Grammy Award win for IN THE HEIGHTS Original Broadway Cast Album, IN THE HEIGHTS: IN CONCERT features an exciting stand up concert event featuring such memorable songs as “Breathe,” “96,000,” “When You’re Home,” and “In The Heights.” Tony-award nominated director Thomas Kail and Tony-award winning orchestrator Alex Lacamoire are returning for the concert presentation, along with Tony-nominated original lighting and sound designers Howell Binkley and Nevin Steinberg. IN THE HEIGHTS: IN CONCERT is produced by its creator, Lin-Manuel Miranda, and co-produced by Stephen Gabriel and Luis A. Miranda, Jr.
“Bringing Broadway to Washington Heights, the actual setting of IN THE HEIGHTS, is a wonderful celebration of live theatre and its many inspirations,” said Charlotte St. Martin, Executive Director of the Broadway League. “Broadway is an art form that is about creating emotions and developing a connection with audiences. Viva Broadway and Family First Nights share the mission of encouraging multiple generations of family to come to Broadway together, so we're pleased that this collaboration with the IN THE HEIGHTS creative team will enable more people to attend Broadway shows." Tickets for IN THE HEIGHTS: IN CONCERT may be purchased online beginning on December 14th by visiting Telecharge.com (212-239-6200). A special block of tickets are available for Upper Manhattan residents that can be purchased in person for $30 each at the Manhattan Times office located at 5030 Broadway, Room 801, New York, New York 10034. For additional information on IN THE HEIGHTS: IN CONCERT, please visit www.linmanuel.com, www.manhattantimesnews.com and www.broadwayleague.org.